Living… in 1952 New Jersey, in a beautiful, old mansion. She lives close enough to New York for day trips into the city, which she takes frequently. Profession… housewife, and an unhappy one. Carol has always felt stifled by her life in the suburbs, like she hasn’t had the opportunity to be her true self. She loves her daughter Rindy very much, but there are other things in her life that she finds fulfilling besides her household and she’d like to experience more of them. Interests… smoking, driving, and records. Carol also has a penchant for the finer things in life, like manicured nails and fur coats. Challenge… being true to herself while also being a mother. 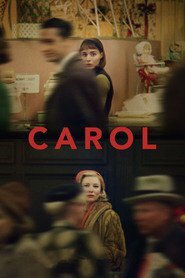 Carol is finally breaking free of her stifling marriage, but becoming a self-actualized woman in the 1950s is not easy. Also, the fact that Carol is a lesbian is not making the divorce proceedings any easier. Personality… glamorous, charismatic, and soulful.Carol is driven to fight to make her life better, whether that means going after a divorce or pursuing the woman she loves. Carol Aird's popularity ranking on CharacTour is #1754 out of 5,000+ characters. See our top-ranked characters and read their profiles.